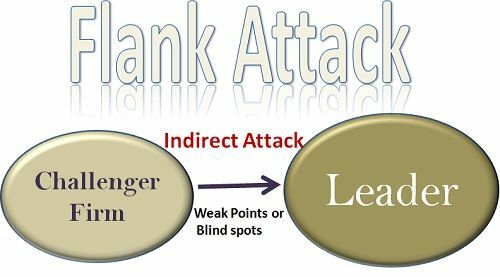 Definition: The Flank attack is the marketing strategy adopted by the challenger firm and is intended to attack the weak points or blind spots of the competitor, especially a leader. A flank attack strategy is based on the assumption, that a large firm, may have several product lines and a wide range of services, but may not be necessarily a leader in all the categories. Thus, the flack attack is intended to capture that segment wherein the established player is underperforming. LG outflanked the other colored TV producers in India, by launching a rural-specific color TV “Sampoorna”, thereby becoming the first one to tap the rural areas. Woodland outflanked the other big players, Viz Bata, Liberty by introducing the robust, durable, rough and tough outdoor shoes, and hence captured the untapped market segment. The challenging firm may launch the frontal attack in either of the strategic dimension Viz. Geographic and segmental. In geographic attack, the firm looks for the areas where the established firm has not catered to the needs of or is lagging behind. Whereas, in the case of a flank attack, the challenger looks for the market segments, left untapped by the established firm and tries to tap those markets with its offerings.